Woo hoo! 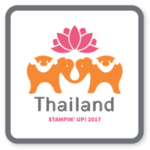 I’m back from the Stampin’ Up Incentive trip to Thailand – feeling refreshed (once the jet lag wore off! 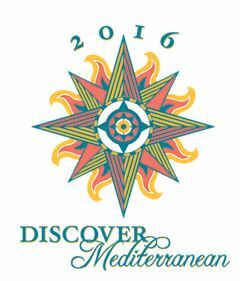 😉 ) and excited for the upcoming Holiday catalog! Winter is my favorite season, filled with twinkly lights, beautiful scenes, and an extra bit of kindness to go around. 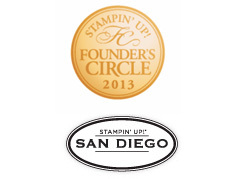 Before I left for Thailand, Stampin’ Up announced an amazing starter kit promotion that gives you an extra $72 in bonus goodies when you join in July! One of those items was the sneak peek stamp set “Carols of Christmas”. So, when it was time for our Fun n’ Crafty Stampers group blog hop – and the theme was Christmas in July, I knew what I wanted to play with! Our team also did a fun swap using this stamp set this month (since we were able to preorder it), and so this was my swap card. 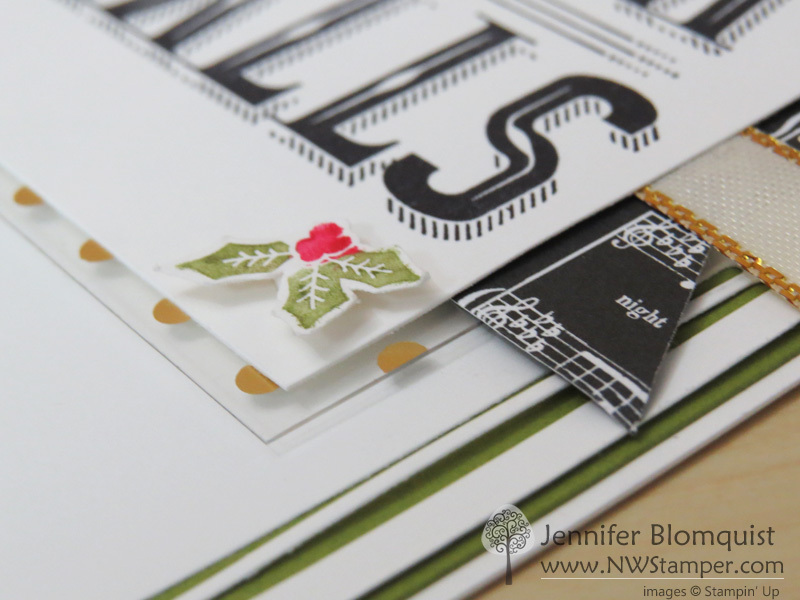 It was easy to put together thanks to the Carols of Christmas stamp set and Card Front Builders framelits (yes, they will be available as a bundle as part of an early release starting August 1!). In fact, I created a video tutorial at the end of this post to show you how to put it all together! It all started because I really wanted to play with these border dies that come in the Cart Front Builders framelits. I was thinking they would look cool, but I really wanted them to POP! So I got the idea of layering them with a dark color behind the holes. Thankfully, the die is sized to fit perfectly in a 4″x5 1/4″ layer on your card front, so I could make my matting just a smidgen larger to get that extra border of Old Olive. Once I had that in place, I focused on my sentiment. 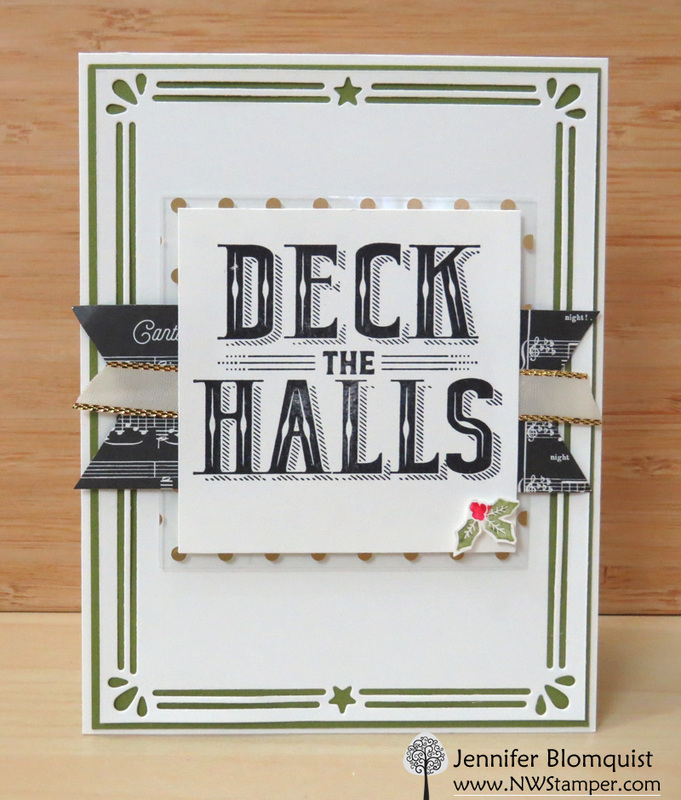 In this case, the ‘Deck the Hall” from the Carols of Christmas stamp set. It was a cool bold sentiment, so I didn’t want to mess with it too much, so instead I looked for ways to highlight it from behind. First I knew I wanted to add some designer paper behind. 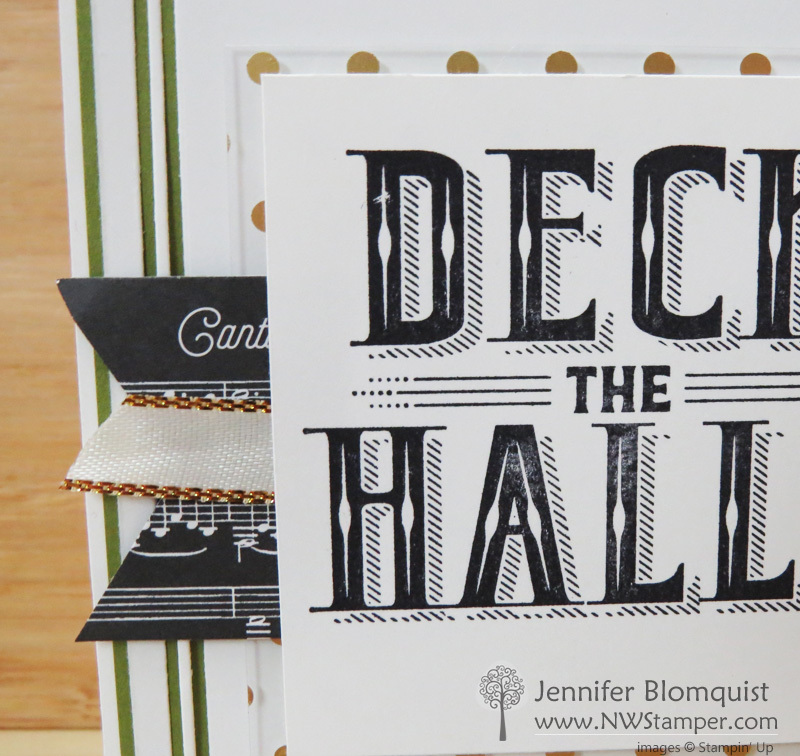 I loved the new specialty paper from the Holiday Catalog that is all music sheets and music notes, and the contrast of the black with so much white in the card was perfect! (This paper is thinner like the newsprint specialty paper, and so you get half a pack with a black background and white print, and half a pack of white background with black print – for a total of 24 sheets in the pack!). But it still needed something, and gold was the perfect touch with the new Metallic Edge ribbon from the annual catalog. It is satin with that metallic stitching on the edge… soooo pretty! 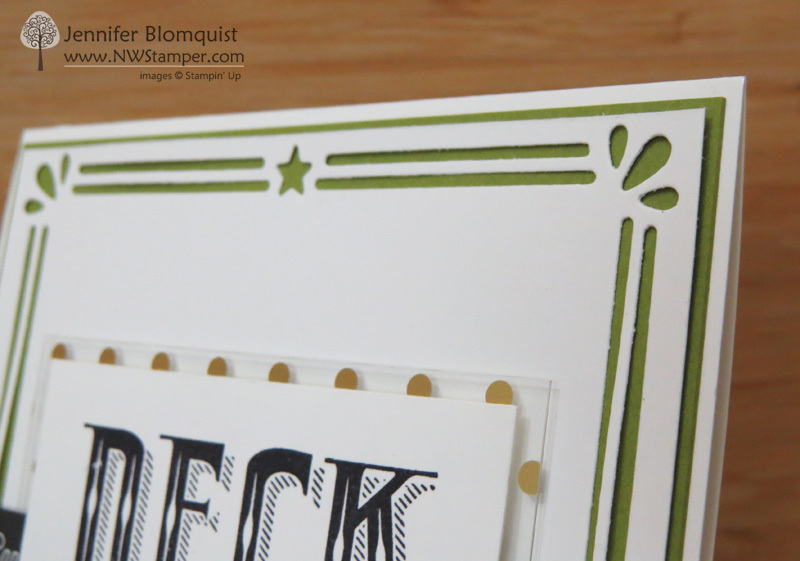 But I couldn’t stop there… seriously, sometimes I think I have a problem calling a card done! ha ha ha! So, to get a little more gold without overwhelming the card, I added a small mat behind the sentiment using the Fabulous Foil designer acetate. Each pattern can be used either as gold (on one side) or silver (the other side). Of course, I used gold here, but I love the versatility. Then for a little pop of color, I stamped the holly from the same stamp set and cut it out and popped it up on a mini-dimensional. So, lots of little pieces, but nothing hard to do! Don’t believe me? Check out the video tutorial below! 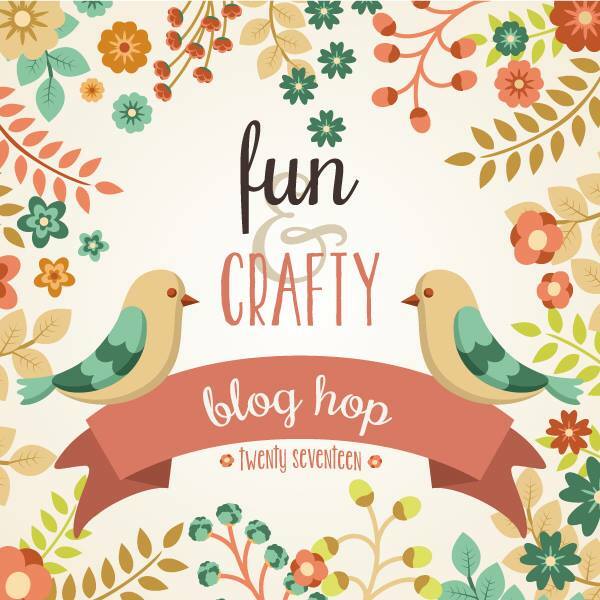 Get more holiday ideas on the Fun n’ Crafty Blog Hop! We have more amazing holiday cards lined up for you, so I invite you to hop along and check them all out! We all would love to hear what you think too. Next up is Stacey, and she never disappoints! As promised, check out this video to learn a little more about the starter kit promotion in July and how to make this card! (Hop to 1min 40sec to get to the start of the card tutorial). Seriously … cute! I like how you’ve shared another new item from the holiday catalog. Sneaky girl! I like that you stamped in black. I don’t often think of black for Christmas, but it looks elegant, especially with the gold accents. Thanks, Stacey! Hopefully it gets to you any day now! Jennifer what an awesome card! I especially like the way you added DSP and ribbon in the background. I guess we both love the frame maker die.